Potato chips with real Iberian ham flavour. Potato chips with fruity notes and lightly popping. Potato chips with genuine de La Vera hot smoked paprika. 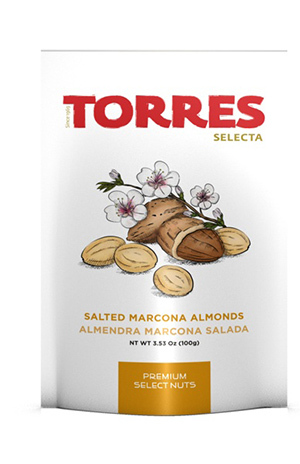 Torres has selected the best Mediterranean Marcona Almonds, essential in any healthy balanced diet thanks to their nutritional richness. They are rich in fiber and a good source of calcium and healthy fatty acids. Marcona almonds, refined vegetable oil and salt. Does not contain lactose or egg products. May contain traces of peanuts or other nuts.